One of the best parts of living in Los Angeles is all the wonderful mid-century furniture stores, especially the ones on Beverly Boulevard. 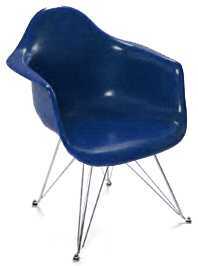 With all respect to the people at DESIGN WITHIN REACH, MODERNICA'S Eames Eiffel chairs are better. Why? Because even though they don't have the Herman Miller stamp, they are closer to the original (the Modernica version uses fiberglass, DWR doesn't because it is not a recyclable material), and you can choose from many colors and bases.